Note: He broke his maiden at Belmont on September 11, and then finished 4th in the Champagne Stakes (G1) on October 10. Skipping the Breeders' Cup, he won the Kentucky Jockey Club Stakes (G2) at Churchill Downs on November 28. 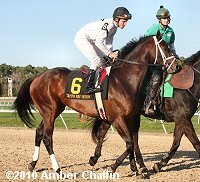 In his 3-year-old debut, he finished 3rd as the favorite in the Tampa Bay Derby (G3) on March 13. He finished second in the Arkansas Derby (G1) on April 10 at Oaklawn. Won the Kentucky Derby by 2 1/2 lengths as the 8-1 second choice, then finished a disappointing 9th in the Preakness beaten 11 3/4 lengths, ending his Triple Crown hopes.